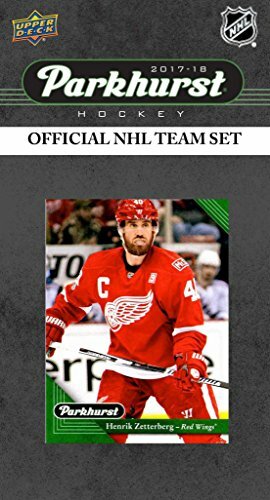 Detroit Red Wings 2017/18 Upper Deck Parkhurst NHL Hockey EXCLUSIVE Limited Edition Factory Sealed 10 Card Team Set including Henrik Zetterberg, Evgeny Svechnikow Rookie & all the Top Stars! Wowzzer! We are Proud to offer this Detroit Red Wings 2017/18 Upper Deck Parkhurst NHL Hockey Brand New EXCLUSIVE Limited Edition Factory Sealed 10 Card Team Set! 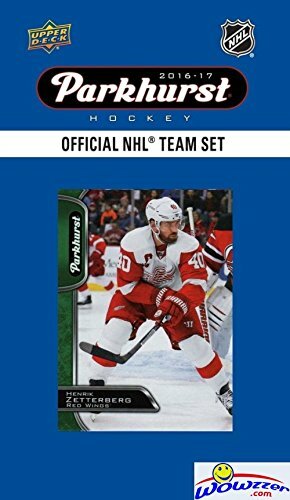 This Factory Sealed Team Set including Henrik Zetterberg, Jim Howard, Andreas Athanasiou, Anthony Mantha, Dylan Larkin, Gustav Nyquist, Tomas Tatar, Trevor Daley, Evgeny Svechnikov Rookie card and an EXCLUSIVE Red Wings team card found only in these team sets! This is a MUST HAVE Collectible for all fans of this NHL Team! This Team Set is a Great Way to Remember the Season! Includes all the Top Players and Rookies! Makes a Great Gift!Check out our Amazing Prices and Large Selection of Factory Sealed Boxes, Sets, and Singles of MLB, NFL, NBA, NHL, Soccer & Much More! We also have a HUGE Selection of BCW and Ultra Pro Supplies!Plus be sure to check out our Super Popular Amazing Beckett GGUM AUTHENTIC GAME USED MEMORABILIA GRADED Cards! Look for Cards of Michael Jordan, Mickey Mantle, Lebron James, Kobe Bryant, Cal Ripken, Mark McGwire, Dave Beckham, Elvis Presley & Many More!Search- BECKETT GGUM BGS to find these Great Looking Graded Game Used Memorabilia Cards! 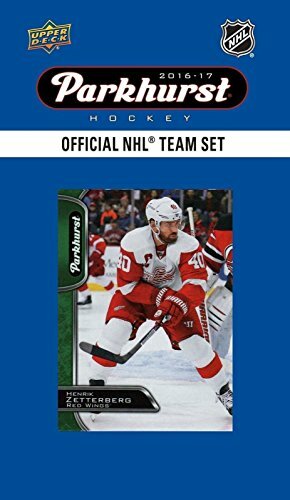 Detroit Red Wings 2016/2017 Upper Deck Parkhurst NHL Hockey EXCLUSIVE Limited Edition Factory Sealed 10 Card Team Set including Henrik Zetterberg, Mike Green & all the Top Stars! Wowzzer! 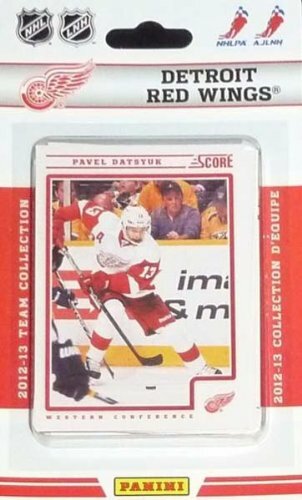 We are Proud to offer this Detroit Red Wings 2016/2017 Upper Deck Parkhurst NHL Hockey Brand New EXCLUSIVE Limited Edition Factory Sealed 10 Card Team Set! 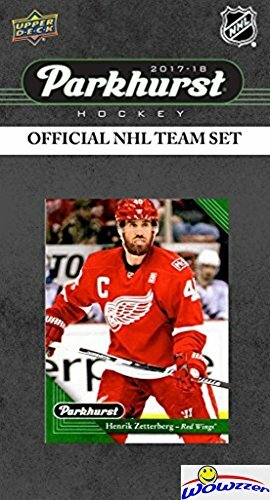 This Factory Sealed Team Set including Henrik Zetterberg, Mike Green, Gustav Nyquist, Justin Abdelkader, Tomas Tatar, Frans Nielsen, Niklas Kronwall, Petr Mrazek, Dylan Larkin and Anthony Mantha. This is a MUST HAVE Collectible for all fans of this NHL Team! This Team Set is a Great Way to Remember the Season! Includes all the Top Players and Rookies! Makes a Great Gift!Check out our Amazing Prices and Large Selection of Factory Sealed Boxes, Sets, and Singles of MLB, NFL, NBA, NHL, Soccer & Much More! We also have a HUGE Selection of BCW and Ultra Pro Supplies!Plus be sure to check out our Super Popular Amazing Beckett GGUM AUTHENTIC GAME USED MEMORABILIA GRADED Cards! Look for Cards of Michael Jordan, Mickey Mantle, Lebron James, Kobe Bryant, Cal Ripken, Mark McGwire, Dave Beckham, Elvis Presley & Many More!Search- BECKETT GGUM BGS to find these Great Looking Graded Game Used Memorabilia Cards! 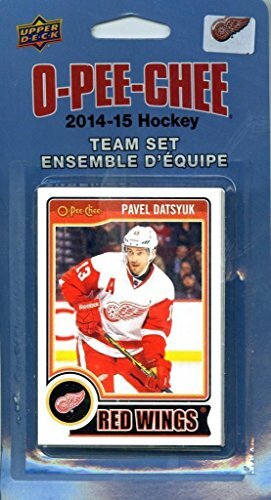 Detroit Red Wings 2014 2015 O Pee Chee NHL Hockey brand new factory sealed 16 card licensed team set made by Upper Deck including Daniel Alfredsson, Pavel Datsyuk, Jonas Gustavsson, David Legwand, Niklas Kronwall, Danny DeKeyser, Jonathan Ericsson, Gustav Nyquist, Johan Franzen, Jim Howard, Brendan Smith, Kyle Quincey, Drew Miller, Tomas Tatar, Henrik Zetterberg and Justin Abdelkader. 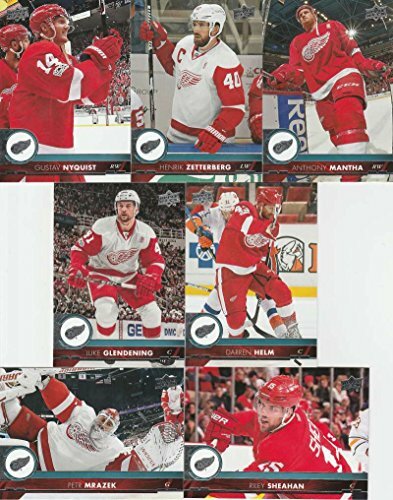 2017-18 Upper Deck Hockey Series 1 Detroit Red Wings Team Set of 7 Cards which includes: Anthony Mantha(#65), Gustav Nyquist(#66), Henrik Zetterberg(#67), Luke Glendening(#68), Petr Mrazek(#69), Riley Sheahan(#70), Darren Helm(#71) Card Conditions are NM-MT. Team set ships in a protective Plastic Snap Case. We have team sets for Baseball, Football, Basketball, Hockey, and Soccer. We have a large selection of Autographs, Jerseys, and Memorabilia cards! 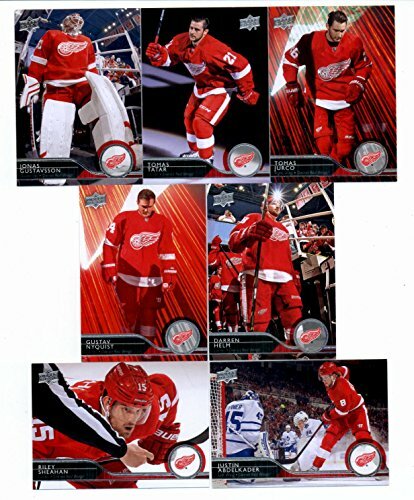 Looking for more Upper Deck Detroit Red Wings similar ideas? Try to explore these searches: West Large Tote, Peripheral Controller, and 1.125' Diameter Flat.